In organic farming systems, soil fertility means more than just providing plants with macro- and micronutrients. Effective fertility management considers plants, soil organic matter (SOM), and soil biology. Ideally, organic farming systems are designed to enhance soil fertility to achieve multiple goals. Important goals include: the protection and, if possible, improvement of soil physical condition so that the soil supports healthy plants and soil-dwelling organisms and has the ability to resist and recover from stresses like flooding or aggressive tillage; the maintenance of soil buffering capacity to minimize environmental degradation caused by soil loss or soils' failure to filter nutrients or degrade harmful compounds; and increased water and nutrient use efficiency by increasing biological fixation and retention of needed nutrients while reducing their loss from the system to the extent possible. Organic farming systems are designed with the aim of maintaining nutrients in organic reservoirs or in bioavailable mineral forms instead of just supplying nutrients through frequent fertilizer additions. 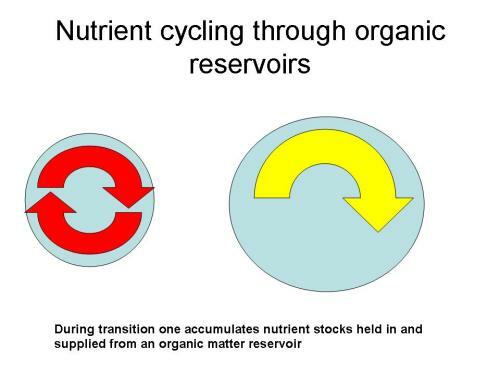 This is achieved by cycling nutrients through organic reservoirs. Soil fertility is improved by organic matter management and not through input substitution. The remainder of this article explains why. Figure 1. This cartoon depicts idealized changes that occur where fast mineral nutrient cycling (depicted by red arrows) in depleted organic reservoirs (depicted by blue sphere) is altered by improved management to result in slower cycling rates (yellow arrow) within an enlarged reservoir. Figure credit: Michelle Wander, University of Illinois. The intention of organic systems is to manage the full range of soil organic and inorganic nutrient reservoirs and prevent unwanted loss by retaining them in forms that can be accessed by crops through biological leveraging. One objective during transition is to enhance symbiotic associations between plants and their microbial partners, organic reserves, and the physical environment. For more on the role that microbes play in N cycling see Soil Microbial Nitrogen Cycling for Organic Farms. plant species are diversified in space and time to fulfill a variety of functions (minimize weeds and pests, support below-ground processes, erosion control, N fixation, build SOM etc.). Organic farming systems cannot rely on use of soluble, inorganic nutrient sources. Conventional fertilizer management guidelines hinge upon assessments of plant-available N and P combined with empirical fertilizer addition studies that are able to provide estimates of the amount of fertilizer required to achieve yield goals. Although many organic producers do use soil testing to assess soil nutrient levels, they report that while these tests often indicate that plant-available N or P may be limiting, their yields do not reflect these soil test results. There are several reasons to expect that organic production systems require their own suite of management tools. First, organic soil amendments vary in quantity and quality. Second, the condition of the soil resource plays a large role because it supplies and recycles added nutrients. Results can vary greatly after organic materials are added for a variety of reasons, some of which, can be managed. Current research on organic fertility management is looking closely into avenues for soil testing and management of amendments and soil biology to optimize fertility by taking into account the synergisms that occur in biologically active soils. Figure 2. 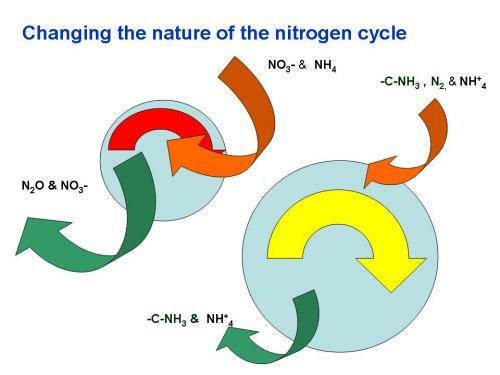 The figures above depict changes in N cycling in systems where N is supplied in inorganic fertilizers to systems that rely on organic sources. The size of the blue sphere represents the active or labile fraction of soil organic matter and the thickness and coloration of the arrows reflect the size and cycling rates of nutrient reserves. Red arrows identify pools that cycle more rapidly than yellow. Figure credit: Michelle Wander, University of Illinois. Loss of nutrients applied to agricultural soils causes environmental harm. Off-site problems caused by over-application of nutrients are better recognized than are problems caused on-site. Conventional agriculture is cited as the primary source of non-point source and P pollution that contributes to myriad environmental and health risks. Problems of over-application in organic systems vary; probably P over-additions are most widespread where manure is readily accessible. This is because the ratio of P to N in manure exceeds that required by the plant. Over-addition of N, particularly in readily available forms, is a common problem in agriculture. Over-addition in organic systems can occur in situations where leaching is restricted (e.g. in greenhouses) or after N rich cover crops or manures are applied. The notion that N surplus promotes microbial activity that contributes to nitrate leaching and nitrous oxide emissions, two important environmental problems, which works against organic matter storage, is finally being recognized by main stream scientists. Excess nutrients can also increase plant susceptibility to pathogens and arthropod pests and can also lead to increased weed competition. For current research results see the video presentation by Larry Phalen on Biological Buffering. Tendencies toward nutrient leaching and the ability to hold and retain nutrients vary with soil types and climate. Soil texture and CEC are related to this, with nutrient storage capacity increasing with soil clay and silt contents and cation exchange capacities. Decay of weed seed and inhibition of weed seed germination. There is growing acceptance that maintenance of high levels of available nutrients works against these processes and accelerates organic matter decay. In addition, nutrient excess or imbalance can compromise plant and animal health. Excess tillage can have a similarly undesirable effect on soils and soil organisms. Of course tillage is an important tool for fertility management. Perennial sods are mechanically killed, cover crops are plowed in, and manures are incorporated. The figure below shows how tillage has been argued to alter the soil food web (Fig. 3). Heavy reliance on tillage in organic farming systems can only be maintained without harm in systems that include adequate plant cover and where tillage is timed to avoid compaction and erosion. Soil texture, slope, and climate all influence the degree to which tillage can or can not be safely tolerated. Figure 3. The increased soil stratification and size and activity of soil organism populations under conservation tillage compared to conventional tillage lead to increased nutrient retention. Figure credit: Ed Zaborski, University of Illinois. Adapted from House and Parmelee (1985). This is why organic strategies for fertility management focus as much or more on crop rotation and tillage practices than they do on nutrient dense soil amendments. The contributions of carbon-rich amendments and roots to soil fertility are recognized within organic systems. House, G. J., and R. W. Parmelee. 1985. Comparison of soil arthropods and earthworms from conventional and no-tillage agroecosystems. Soil and Tillage Research 5: 351–360. Phalen, L. undated. Biological buffering: Building resilience from the ground up [Online audio slide presentation]. Agroecology and Sustainable Agriculture Program, University of Illinois, Urbana. Available at: http://www.vimeo.com/2151324 (verified 11 Jan 2009). Darwin, C. 1881. The formation of vegetable mould through the action of worms with observations on their habits. John Murray, London. Hopkins, C. 1910. Soil fertility and permanent agriculture. Ginn and Company, Boston, MA. King, F. H. 1911. Farmers of forty centuries; or, Permanent agriculture in China, Korea, and Japan. Courier Dover Publications, New York. Waksman, S. 1936. Humus: Origin, chemical composition, and importance in nature. The Williams & Wilkins Company, Baltimore, MD. Albrecht, W. A. 1938. Loss of organic matter and its restoration. In Soils and Men. United States Department of Agriculture. U.S. Government Printing Office, Washington, DC. Northbourne, L. 1940. Look to the land. 1st ed. Dent and Sons, London. Howard, A. 1943. An agricultural testament. Oxford University Press, London. Balfour, B. E. 1942. The living soil. Faber and Faber, London. Rodale, J. I. 1945. Pay dirt: Farming and gardening with composts. Devin-Adair, New York. Pfieffer, E. 1947. Soil fertility, renewal and preservation: Bio-dynamic farming and gardening. Faber and Faber, London. Odum, E. 1969. Strategy for ecosystem development. Science 164: 262–270. (Available online at: http://dx.doi.org/10.1126/science.164.3877.262) (verified 21 March 2010). Koepf, H. H., B. D. Petterson, and W. Shaumann. 1976. Biodynamic agriculture: An introduction. Anthroposophic Press, Spring Valley, NY. Lowrance, R., B. R. Stinner, and G. J. House. (ed.) 1984. Agricultural ecosystems; unifying concepts. John Wiley and Sons, New York. Norton, B. G. 2005. Sustainability: A philosophy of adaptive ecosystem management. University of Chicago Press, Chicago. Paustian, K., H. P. Collins, and E. A. Paul. 1997. Management controls on soil carbon. p. 15–49. In E. A. Paul, K. A. Paustian, E. T. Elliott, and C. V. Cole. (ed.) Soil organic matter in temperate agroecosystems: Long-term experiments in North America. CRC Press, Boca Raton, FL. Pearson, H. L., and P. M. Vitousek. 2002. Soil phosphorus fractions and symbiotic nitrogen fixation across substrate-age gradient in Hawaii. Ecosystems 5: 587–596. (Available online at: http://dx.doi.org/10.1007/s10021-002-0172-y) (verified 21 March 2010). Phillips, C. J., D. Harris, S. L. Dollhopf, K. L. Gross, J. I. Prosser, and E. A. Paul. 2000. Effects of agronomic treatments on structure and function of ammonia-oxidizing communities. Applied and Environmental Microbiology 66: 5410–5418. (Available online at: http://www.dx.doi.org/10.1128/AEM.66.12.5410-5418.2000) (verified 1 Dec 2015). Randall, G. W., D. R. Huggins, M. P. Russelle, D. J. Fuchs, W. W. Nelson, and J. L. Anderson. 1997. Nitrate losses through subsurface tile drainage in Conservation Reserve Program, alfalfa, and row crop systems. Journal of Environmental Quality 26: 1240–1247. (Available online at:https://www.agronomy.org/publications/search?search[-3]=&searchType[-3]=Any&search[-2]=Randall&searchFields[-2][Author]=Author&searchType[-2]=Phrase&search[-1]=&searchFields[-1][Title]=Title&searchType[-1]=Phrase&volume=26&issue=&year=&first-page=&journal[jeq]=jeq&search=) (verified 4 April 2011). Rastetter, E. B., P. M. Vitousek, C. Field, G. R. Shaver, D. Herbert, and G. I. Agren. 2001. Resource optimization and symbiotic nitrogen fixation. Ecosystems 4: 369–388. (Available online at: http://dx.doi.org/10.1007/s10021-001-0018-z) (verified 21 March 2010). Schimel, J. P., and J. Bennett. 2004. Nitrogen mineralization: Challenges of a changing paradigm. Ecology 85: 591–602. (Available online at: http://dx.doi.org/10.1890/03-8002) (verified 21 March 2010). Stockdale, E. A., M. A. Shepherd, S. Fortune, and S. P. Cuttle. 2002. Soil fertility in organic farming systems—fundamentally different? Soil Use Management 18: 301–308. (Available online at: http://www3.interscience.wiley.com/journal/119192126/abstract) (verified 21 March 2010). Wander, M. 2009. Agroecosystem integrity and the internal cycling of nutrients. p.137–166. In P. Bohlen and G. House (ed.) Sustainable agroecosystem management: Integrating ecology, economics, and society. Taylor and Francis, New York.